Just more proof that a mother's love transcends time. In "Love You Forever," children's author Robert Munsch wrote, "As long as I'm living, my baby you'll be." 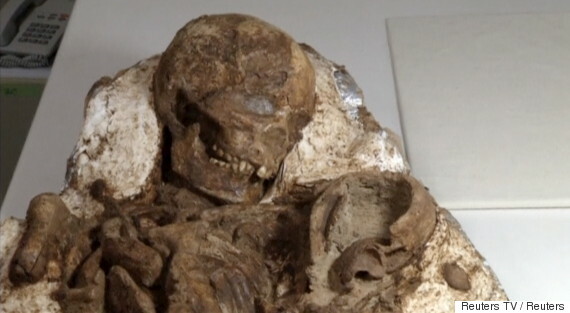 Archeologists in Taiwan have proven him right, and then some — a recent discovery shows a mother's love endures, even after she's been dead for 4,800 years. Scientists discovered 48 sets of human remains in the country's Taichung region, proof of some of the earliest signs of human life in the area, Reuters reported Tuesday. One set of remains was the fossilized skeleton of a mother who's been holding her baby for almost five millennia. The fossils were found at Taichung's Ann He Road Ruin, according to NBC News. The site was uncovered in May 2014 and excavating the fossils took a year. Carbon dating identified the bones as being 4,800 years old.